You can have your very own fan web site like this one--FREE! Get 20 meg of web space, yourname.fanspace.com, unlimited free e-mail at your domain and more! Click here to sign up with FanSpace.com. If you want to see pictures I took at previous conventions, click here. Sorry, I have not updated in quite a while. I will be doing a major overhaul and update soon, including a search for conventions and a mailing list for updates. 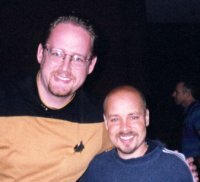 can be found at Chuck's Star Trek Convention Page. This page was last updated Wednesday, September 12, 2001 . This Science Fiction Conventions Webring site is administered by Eric Stone.